Polar bears are found in Alaska, Northern Canada, Greenland, Norway, and other locales above the Arctic Circle. Since polar bears spend most of their time in the sea hunting food, the best time for viewing is when the ice melts and they spend most of their time on shore. These marine mammals, which are on the Endangered Species List, are truly magnificent to behold, particularly in their own natural environment. The boars, or males, can weigh in excess of 1,400 pounds and the adult sows, or females, weigh approximately 600 pounds. A boar can stand more than 10-feet tall on its hind legs, which makes it a creature you don't want to see up close and personal, unless you're a safe distance away or inside the confines of a special viewing vehicle. While it's not mandatory to join a tour to view polar bears, it is advisable. Aside from safety (a significant factor to consider) you're more likely to see polar bears when traveling with an established tour company than on your own. The guides know where to look for bears and are more likely to spot them with their white fur against the white tundra, than the average tourist. Also the special vehicles used by the tour companies do not harass or bother the bears, while keeping travelers safe. Several companies offer polar bear tours in Alaska, particularly if you want to visit the Arctic National Wildlife Refuge, where there has been a push to drill for oil in an important locale for denning, pregnant polar bears. Warbelows Air Ventures flies from Fairbanks, Alaska in September and October and clients stay in an Inupiat village found on the reserve. If you travel with them, they will guarantee you'll see polar bears in the wild. Wild Alaska Travel has a 6 day/5night trip and a 10 day/9 night trip, both departing from and returning to Fairbanks. The tours go to one of the most remote villages in Alaska, Kaktovik on Barter Island, which is offshore from Alaska's North Slope. The longer tour includes more van travel and the opportunity to see the Northern Lights. The tour groups are small and they book up early, so be sure to reserve your spot as soon as you can. In Canada, the town of Churchill, located in Manitoba, is often referred to as the "Polar Bear Capital of the World." Of course, this makes it another great destination for watching polar bears and there are several companies that run tours in the region. The Great Canadian Travel Company offers a variety of polar bear tours around Churchill. This company's trips range from a single day in the tundra vehicle to a longer, guided tour that includes two days on the buggy. Tours start in Winnipeg and travelers have an option of taking a train to and from Churchill for a different kind of adventure. Natural Habitat Adventures leads polar bear tours to Churchill, traveling along the shores of Hudson Bay. 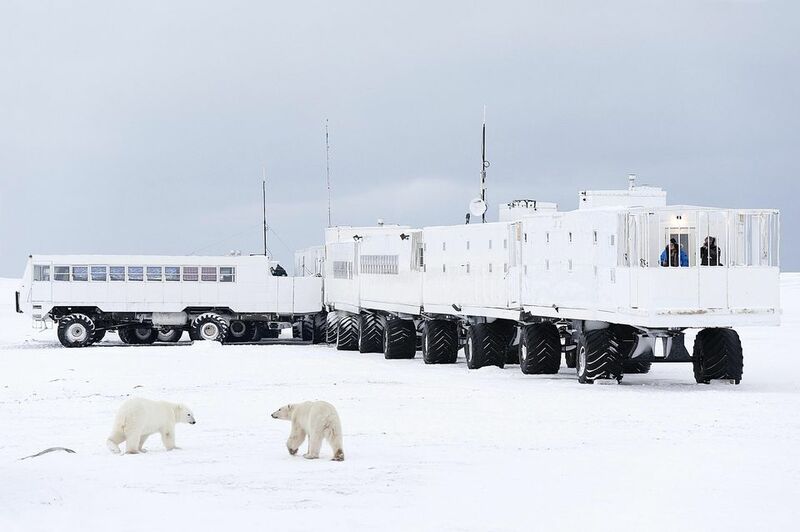 The company's "custom-built Polar Rovers" have six-foot tires and special observation decks, as well as a comfortably heated interior for close up viewing of the creatures. Churchill Wild has excursions to see polar bears in their natural habitat both in the summer and in the winter. In the summer you may see bears frolicking near wildflowers and grazing in the grasslands. But as things begin to cool off, the Great Ice Bear Adventures take place in October and November. Churchill Wild has its own eco-lodge and the itinerary includes the 30-kilometer flights to and from that spot. This is a special opportunity to stay someplace other than a Churchill hotel. Check it out and ask questions about the accommodations. Alaska and Canada aren't the only places to spot polar bears in the wild. Norway's Svalbard archipelago is also a magnificent destination for this who want to see these creatures in their natural habitat. The area is home to a bear population that is believed to number somewhere in the neighborhood of about 3500, making them a common sight for those who live or visit the region. There are several tour operators who lead trips into the Svalbard area, including 50º​ North and even National Geographic Expeditions. As with most other tours of this kind, the trips are handled in an eco-friendly fashion and with an eye on sustainable tourism throughout the places visited. Polar bears are indeed threatened by climate change, human encroachment on their habitats, and other issues. But, with a reputable travel company you can get a chance to see them up close, without causing harm or damaging the habitats in any way. The opportunity to do that is well worth the effort.